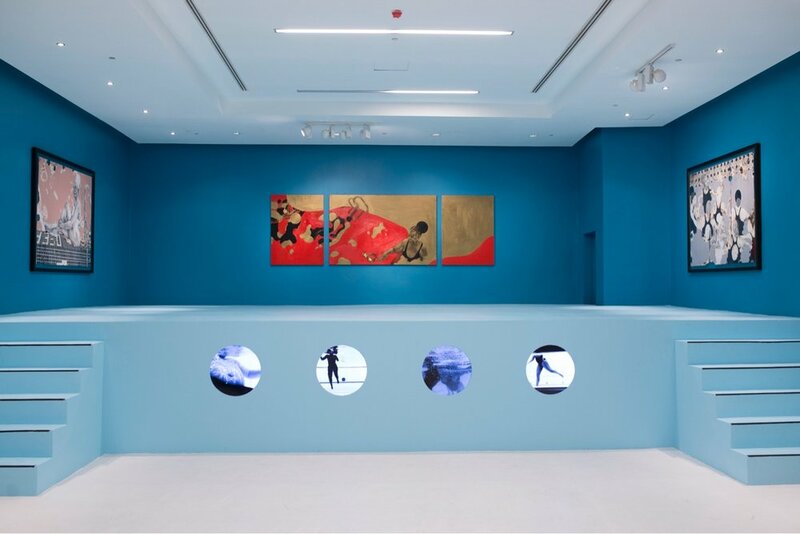 Modupeola Fadugba: Dreams from the Deep End presents an immersive installation, evoking the pool as a nostalgic yet contested space, where communities gather to play, learn, rest, and resist. Yet, within this watery oasis, there also lurk more turbulent experiences of risk, exclusion, and the looming chance of drowning. Nonetheless, in the deep end, resilience surfaces and togetherness triumphs. Togo-born, Nigerian artist Modupeola Fadugba’s multi-media practice encompasses painting, drawing, and socially engaged installation, which address ideas of identity, social justice, and game theory in order to navigate cultural hierarchies. Furthermore, as an avid and lifelong swimmer, Modupeola has a profound personal af nity for the pool and its capacity to foster health, creativity, and con dence. It thus remains a potent recurring motif throughout her diverse bodies of work. Dreams from the Deep End, shown during the summer of 2018, at Gallery 1957, expands her focus on powerful Black gures together in water. 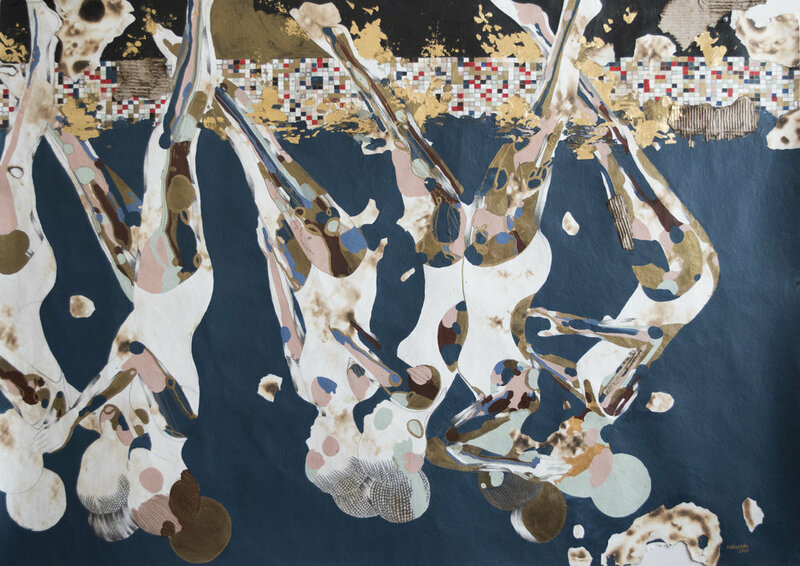 In the artist’s celebrated on-going series Synchronised Swimmers, one is submerged in an abstract underwater world, lled with dynamic, moving bodies, weaving stories about teamwork, friendship, and unity. These swimmers function as a visual tool for Fadugba to explore the ever-changing challenges experienced by artists, and the power of togetherness to defy the odds – from transcending the rules of a game to defying debilitating stereotypes. During Fadugba’s residency at ISCP in New York City this summer, she sought to contextualise her focus on swimming within the greater context of visibility, access, and representation. Her research has been greatly informed by Jeff Wiltse’s publication Contested Waters: A Social History of Swimming Pools, which explores the history of public pools and their privatisation, in relation to race politics and community life in America. 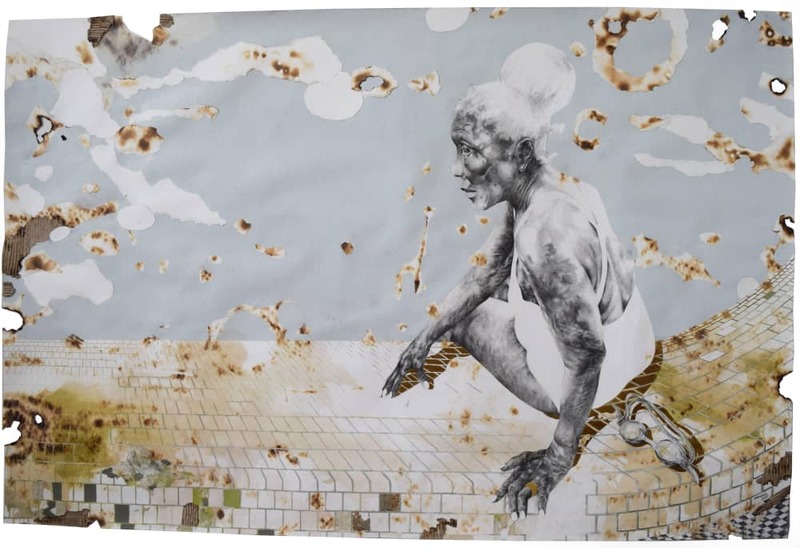 In the artist’s search to explore the visibility of black swimming bodies and consider elements of learning, collaboration, and competition, she found inspiration in The Harlem Honeys and Bears – a synchronised swimming team of senior citizens, who perform sensational water acrobatics and offer free swimming lessons to local children. Through paintings and multimedia installations, Modupeola represents the trials and triumphs experienced by this extraordinary group and the communities they serve. Moreover, her interest in learning and recreation within the pool is a direct extension of the artist’s fascination with game theory and statistics. Whilst studying economics and chemical engineering, Modupeola frequently came across this quintessential illustration of correlation versus causation: “When ice cream sales go up, drownings increase. Does ice cream cause drowning? No, the lurking variable is a hot summer day, which boosts ice cream sales and swimming.” The juxtaposition of these two entities profoundly struck Modupeola: how might eating ice cream, one of her favourite pastimes, play against a deep-seated cultural fear within many black communities, in which youths are more likely to drown at a rate ve times higher than other children? How can something ominous be balanced by something hopeful? This deductive yet sincere logic has been ingrained in Fadugba’s artistic practice since she worked on her award-winning project, The People’s Algorithm (2014), an installation where participants play an interactive game, seeking to address the critical situation of education and unemployment in Nigeria. 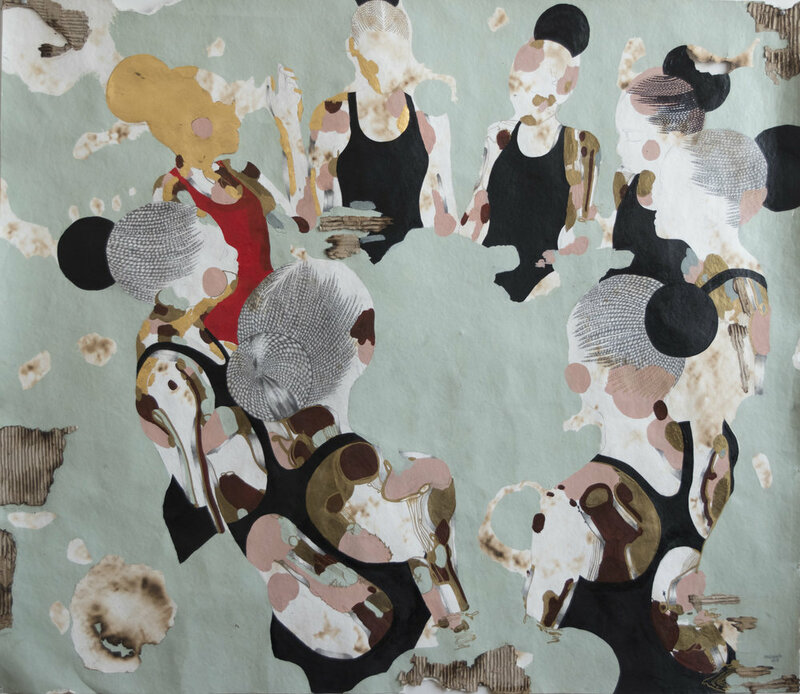 This work, and Fadugba’s developing interest in inter-disciplinary collaborations with other artists and local communities, illuminates the heart of her overarching practice and mission: to activate people through cultural exchange, collective consciousness, and states of motion – always ready to decipher and play. And it was with this type of audience engagement in mind that the immersive underwater installation for Dreams from the Deep End was imagined. Upon entering the pool you might hear gently lapping water from a synchronised performance, or one of Coach Footé’s rousing pep talks, resonating off the tiled walls of the Hansborough Recreation Center, in Harlem. After closely inspecting the artist’s luminous experimentations in artistically rendering water, you’re encouraged to sit back in a sun lounger and pick up a book about David Hockney, whose iconic depictions of aquatic surfaces the artist often turns to for inspiration. This sense of learning and listening, alongside conversation and recreation, is key to Modupeola’s research-based work: connecting with communities. Moreover, the artist’s deep involvement with The Harlem Honeys and Bears this summer also resulted in a distinct change in her creative process, whereby abstraction evolved into narrative representation. 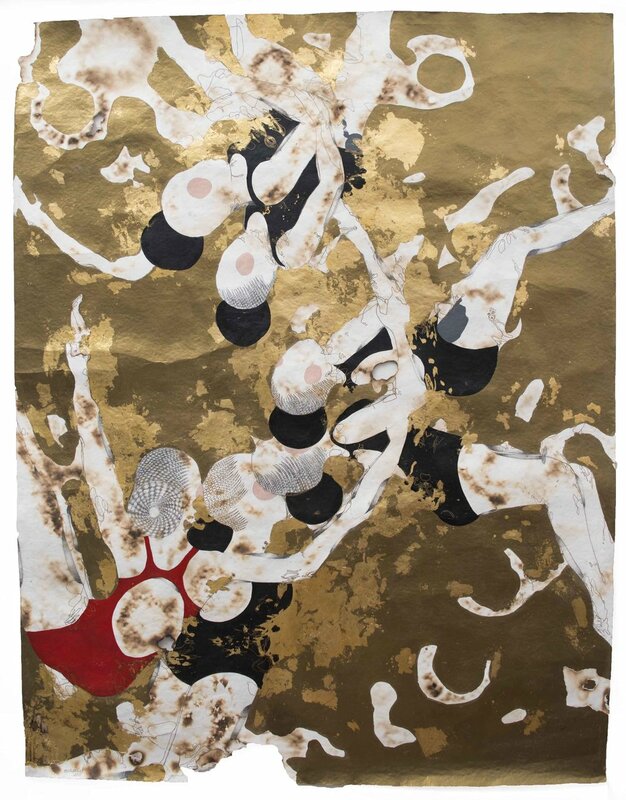 Her characteristic depiction of synchronised swimmers, with delicate burnt paper, overlaid with pops of colour and splendid gold leaf, are now accompanied by new gures differing in age, gender, and purpose. Deep sea–blues and robust, powerful reds punctuate creamy pastels and meditative monochrome to present a new spectrum of the colours of water and people. Millennial pinks gain deeper meaning with reference to painted township buildings in Rwanda and the mysterious Lake Rose in Senegal; iridescent golds conjure up impressionist light as well as Ghana’s contentious colonial and mining history; and the ever-present, red ball of unattainability, found in earlier series like Tagged (2013) and Synchronised Swimmers (2016-17) re-emerges as succulent cherries, fabulously painted nails and lips, and even a satisfyingly spherical swim cap. Ominous deep ends are now counterbalanced by emboldened scenes of swimming lessons, heroic lifeguards, and the tantalising nostalgia of cold, melting ice cream cones. 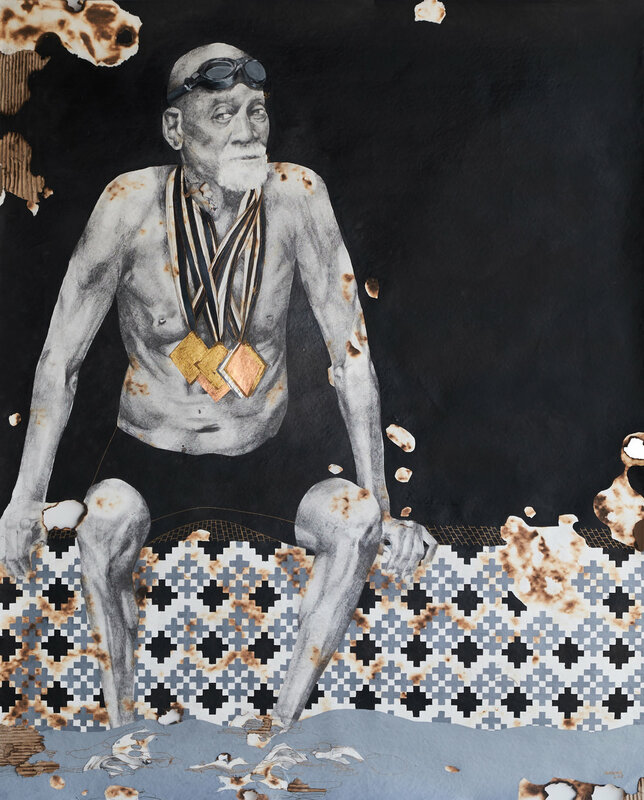 Swimmers young and old come to life through bursts of detail in the form of alluring pool tiles, painstakingly rendered portraits, and intimate multimedia documentation. This new series thus presents a unique development of reverent realism in Fadugba’s artistic practice, re ecting her aspiration to empower individual bodies and voices in this resilient community. And now The Harlem Honeys and Bears have come to Ghana. Whilst developing this research-based project with Modupeola, we talked extensively about the signi cance of home, and what might happen when representations, relating so intimately to an African American audience in New York, travel to a gallery and cultural community in Accra? Modupeola had me read Homegoing by Yaa Gyasi, a young Ghanaian-American novelist, and everything started to synchronise: the novel starts in pre-colonial Ghana and ends up in contemporary Harlem, from the transatlantic slave trade to the inner-city pools of New York City. And thus our creative journey becomes historical, and a professional project becomes personal. How does one balance the socio-political hardship underpinning the lived experiences of people who not only survive but indeed thrive in these contested waters? With a grounding in home, this project honours The Harlem Honeys and Bears wholly and wholeheartedly: their bodies, their stories, their power. Here, swimming pools represent safe and democratic spaces, where one rarely contemplates the dire truism to “sink or swim”. In Modupeola Fadugba’s sustainable poolscapes we’re not just taught how to swim – we’re taught how to dream from the deep end.